Great Leonopteryx | Pandorapedia: The Official Guide to Pandora | Own AVATAR on Blu-ray & DVD Now! The few humans lucky enough to have survived seeing this creature have also marveled at its iridescent grace and command of the Pandoran skies. Its powerful jaws are efficient enough to cleave a mountain banshee in midflight. It has a flow-thru ventilation system that allows for more efficient respiration and cooling. The leonopteryx also has an impressive rate of climb and, when it plummets out of the sky, resembles a massive Terran hawk. Leonopteryx rookeries are difficult to locate, although some have been sited in the Hallelujah Mountains. This species mates for life and breeds only once every two years. They travel singly or in pairs and have never been observed to swarm. They are normally wary of others of their kind, and rightly so; an aerial battle between two leonopteryx that lasted over three hours was observed by a team of avatars. The battle ended when both great beasts fell to the ground, mortally wounded. Based on the distinct yelps, the avatars believed that the wounded leonopteryx were dispatched by a large pack of viperwolves. The leonopteryx is an evolutionary link between the six-limbed form and the four-limbed banshee. 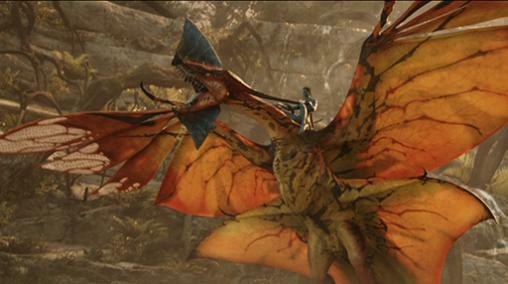 The leonopteryx has true legs, which the banshee does not, and it additionally has four wings, including two forward main wings and two aft canards. It has more in common with the tetrapteron than the banshee, and they are thought to have shared ancestry with the banshee only in the remote past. However the jaw structure has much in common with the banshee, and in fact with the jaws of Pandoran fish, from which both are thought to have evolved in the even more distant past. Striped scarlet, yellow and black, with a midnight blue dorsal and ventral crest on the head. Sharp crest can be used to injure or disembowel prey, and has been observed cutting vines during flight under the forest canopy. Distensible teeth in both upper and lower mandible. Large brain cavity. Membranous wings are stretched taut over carbon-fiber bone structure. Large Primary Vanes at the tips of the forewings. Bony leading edge of the canard wing is thought to have evolved from the middle limb of a hexapodal evolutionary forebear. Powerful talons for grasping prey and perching. Flow-through breathing, with forward facing spiracles between the clavicles and the trapezius muscles at the forward end of the chest cavity. Multiple opercula moderating the inlet flow, into the lung cavity. Gill-like vents aft of rib cage, laterally. Vocalization is much like a banshee, with a syrinx organ in the head fed by airflow pumped up from the lung. Sound passes through cranial resonating cavities before exiting through the upper palate. The wings of the leonopteryx are composed of individual finned members that can separate to act as a slotted airfoil, or overlap and seal to form a solid surface. When separated, they can rotate individually to induce or retard vortex formation. These finned members are not unlike the primary feathers of a Terran bird. As with many Pandoran creatures, the lightweight bones of the leonopteryx are a biologically produced carbon fiber. This gives them them incredible strength, which in turn helps the massive creature achieve flight through the dense Pandoran atmosphere. The fins on the leonopteryx's head serve as airfoils in a sophisticated aerodynamic control system, and as cutting edges. Since they exist equally in both males and females they are thought to have a role in male dominance or competition. Na'vi Name Toruk or "Last Shadow". Taxonomy Leonopteryx Rex, or "King Lion Wing". Habitat Mountain aeries and skies above the Pandoran rainforest. Feeding Ecology Apex aerial predator. Carnivore. Main food source is forest and mountain banshees, occasional medusa. Can also hunt under the canopy and feed on ground animals such as hexapede. No known threat from other creatures. Size Wingspan can exceed thirty meters. Notes Na'vi name derives from belief that if the leonopteryx casts its shadow, it will be the last shadow you will ever see. Has been known to attack human aircraft, probably in belief that they are competing predators infringing on territory.